In a show of indomitable spirit, zeal and grit, Arunima Sinha became the first woman in the world to conquer Mt. Everest in prosthetic legs. The 26-year-old successfully climbed the highest peak in the world, today at 10.55 am with the tri-color flying high. The achievement aptly coincides with the 60th anniversary of the first climb of the zenith of the world when Sir Edmund Hillary and Tenzing Norgay climbed the peak on 29th May, 1953. 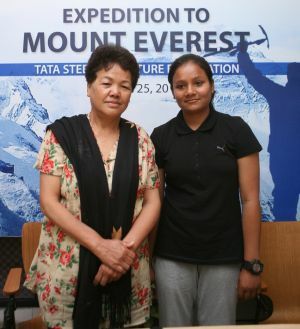 Trained under Ms. Bachendri Pal, Chief, Tata Steel Adventure Foundation (TSAF) and the first Indian woman to achieve the feat, Arunima completed her expedition journey from Kathmandu to the top of the peak in 52 days. She followed Susen Mahato, another climber of Tata Steel Adventure Foundation who summited Mt. Everest on 19th May, 2013. “We congratulate Arunima for her world record achievement and feel proud for our cadet from Tata Steel Adventure Foundation. It’s a moment of pride for the whole nation,” said Ms. Bachendri Pal, Chief- TSAF. “The spirit, mental strength and will power of Arunima have been exemplary which was reflected in her training. She has defied all odds and will be an inspiration for millions throughout the world,” she added. Arunima had trained in the Uttarkashi mountain range, where the team had identified a new route in waist-deep snow in Mugdatal, to get acclimatised to the conditions.